Another Christmas Card theme. Again, I’m trying to tell a story relating to Christmas activities, and going to church on Christmas morning is a time honoured tradition. Last year we had heavy snow at Christmas time and many roads were impassible. For the first time in many years, people had to walk to church, which was a novelty. It was snowing in parts of Ireland today, mid October, very unusual. Apparently the earth is moving into a cold period, a mini-iceage, which will last about 80 years. The last one ended about 1715 ad and many of the images in art from this period showed the effects of this cold spell. The skaters on the Thames in London is one such example. The colours in this painting are almost the same as the previous paintings, at this stage you must be getting bored to tears with the same 4 colours. However, there is one slight change, the blue used is Prussian Blue, otherwise all remains the same. The technique is similar to ‘Going Home for Christmas’. As usual I’ve videoed the process for the next post so come back in a few days and check out process. 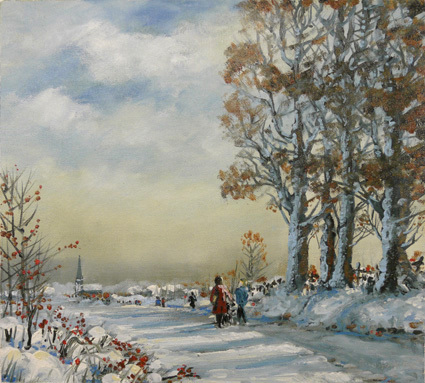 This entry was posted in Oil Painting and tagged Art, Christmas Scene, Culture, Education, Inspiration, Irish landscape, Oil Painting Instruction, Time lapse painting. Bookmark the permalink. Beautiful. One day, I would love to learn more about painting pictures and the shading. Have a great day! Wonderful work. Will be a beautiful card! I love your Christmas paintings! there in. Thanks for this one.